No really, Halloween night was cold, windy, and a bit rainy. In spite of that, however, Namine and I still went out trick or treating for a bit. 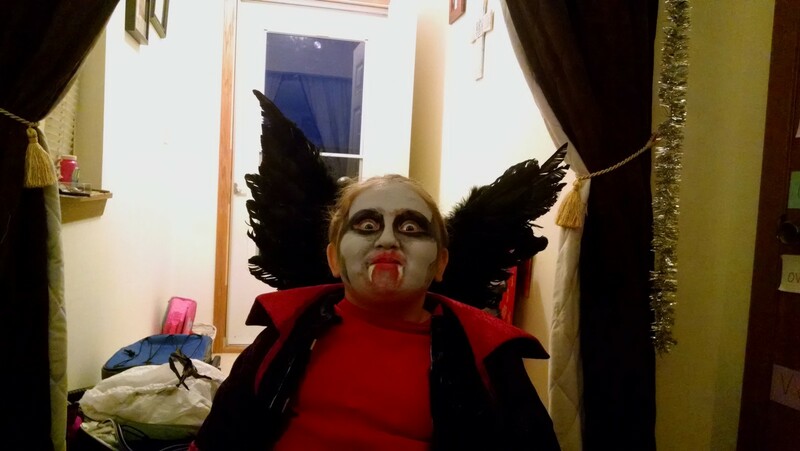 She had been sick the previous weekend, when we had wanted to participate in the Waukesha trick or treat event, so she didn’t want to miss her last chance. It’s still funny to me what Namine wanted to dress up as. I thought for sure that she’d want to go trick or treating in her fancy Belle dress, having gotten it from her Make A Wish trip. But no, she said she wanted to be a vampire. She stuck to it, too; she never changed her mind. Namine held very still as I applied her face paint. She had told me in specific detail what she wanted: gray skin, with black around the eyes. (I embellished a bit around the temples and cheekbones.) White teeth painted below her lips, with a yellow shimmer painted on as well. Then the finishing touch of red paint around the lips and teeth. The look was topped off with a nice red cloak (complete with large collar), borrowed from a friend. It was cold and drizzling a little when we went out. We didn’t stay out for long — Namine catches cold easily — but when we came back in, she had a bag full of candy. I think that the other kids in the neighborhood probably had the same idea, because we didn’t get very many trick or treaters at our door after that. We sat down to our Halloween pizza, and watched about half of Coraline, which Namine had never seen. Halloween isn’t usually a holiday that comes to mind as time to spend with family — certainly not like Christmas or Thanksgiving — but this year we made it one. Jessica and I had bought a little bag full of mini pumpkins, so we got out the box of acrylic paints and made a craft evening of it.